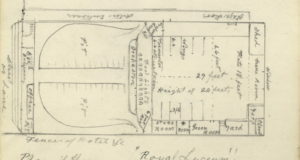 In 1849, wealthy landowner John Ritchey built the Royal Lyceum Theatre on King St. W. It was Toronto’s first purpose-built theatre. 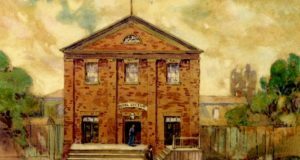 The Lyceum (which eventually burned down in 1875) was the largest and the first fully-equipped theater in Toronto. It had a balcony, dressing rooms, footlights, an orchestra pit–and the Holman Troupe, Toronto’s first opera company. 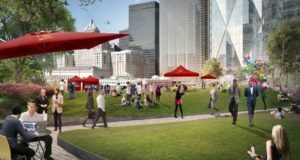 It was at the site of the Lyceum–now occupied by the bronzed cow pasture of the TD Centre–that modern theatre in Toronto was born. The Royal Lyceum Theatre opened in 1849 on King Street West. 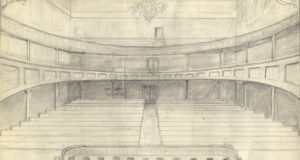 The Royal Lyceum could seat 750 people. The theatre was equipped with a balcony, dressing rooms, footlights, and an orchestra pit. 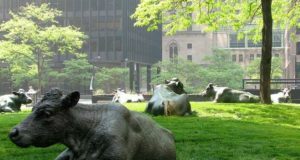 ‘The Pasture’ sculpted by Joe Fafard.